If forced to choose a single caliber of weapon of every category (pistol, shotgun, rimfire, high power rifle, etc. 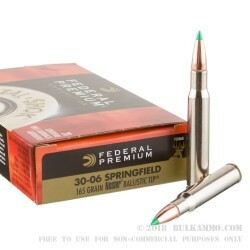 ), you’d be hard pressed to make a case for anything other than the .30-06 Springfield in the high power category. Great range, good trajectory, and super hard hitting it is every bit as much at home filling elk and moose tag as filling whitetail and muley. If the .30-06 is the ultimate utility rifle cartridge, pairing it with high performing Nosler bullets takes it to a whole different level. 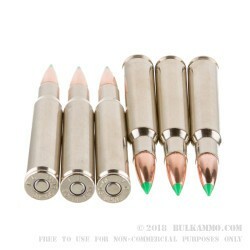 The 165 grain load is well suited for medium game, with a very adequate muzzle velocity of 2,800 fps and a hard hitting 2,872 ft lbs of energy at the muzzle. This is more than enough to put any medium game on it’s haunches alone, but then the added benefit of employing Nosler Vital-Shok which employs a boat tail shape to maximize ballistic coefficient when coupled with the polymer tip. 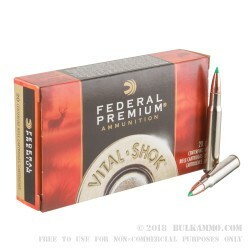 Now is as good as ever a time to go ahead and get that rifle zeroed in for the season coming up around the corner, so pick up a few boxes before prices go up with demand. Q: Is this Product Lead Free? 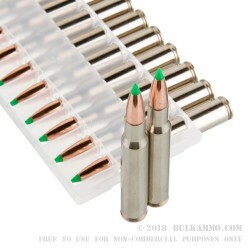 A: Hello Felix, This ammunition is loaded with a standard lead core, copper jacketed projectile with a polymer tip. Unfortunately this is not a lead free product.